It is going to be a tough task for the Congress high command to select candidates for various constituencies of Kangra district as several candidates have sent in their applications for contesting the Assembly polls. It has generated a lot of heat with possibilities of rebellions looming large within the ruling party. The scene of political activity in both the Congress and the BJP will shift to Delhi as senior leaders and ticket-seekers will be camping there to lobby with the central leaderships of their respective parties. With the saffron banners and posters carrying pictures of former Prime Minister Atal Bihari Vajpayee and L.K. Advani and party chief Rajnath Singh sprouting all over the highways and other roads, the town today wears a saffron look as Rajnath Singh among other BJP state leaders Shanta Kumar, Prem Kumar Dhumal and Jai Ram Thakur will address the Yuva Garjna rally targeting state’s over 9-lakh unemployed youth. 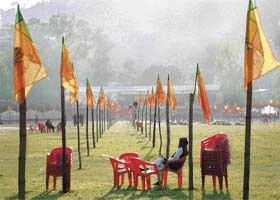 A BJP worker oversees preparations for the BJP rally to be held in Mandi on Sunday. Senior BJP leader and former Chief Minister Shanta Kumar said today, if the BJP was voted to power after the Assembly elections, it would initiate major steps for the welfare of the state government employees. With 22 applicants for the BJP ticket from the Nadaun Assembly constituency, which is the highest in Hamirpur district, deciding a party candidate for the ongoing elections is turning out to be a tedious job for the BJP leadership. State president of the Minorities’ Council, Mohammad K.D. Himachali, in a statement released here today has stated that the Virbhadra Singh government has not only fooled minorities but also failed to rehabilitate nomadic gujjars in the state. 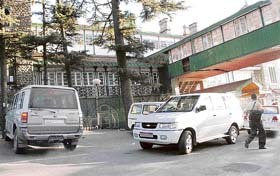 Though there is a designated parking for VIP vehicles, these keep clogging the main entrance to the secretariat in Shimla every other day. A three-member team of the Election Commission of India headed by Naveen. B. Chawla took stock of the preparation for elections for the second phase of polls for the remaining 65 constituencies, here today. The electronic voting machines used at 32 polling stations falling in the Pangi tribal subdivision have been dispatched from Killar to the office of the returning officer headquartered at Bharmour by a helicopter under the supervision of additional chief electoral officer G.K. Srivastva. The BJP has promised to take up the execution of the much-awaited cement plant to be set up at Sikridhar in Churah sub-division of Chamba district soon after it is voted to power in the ongoing Assembly elections. The Rohtang Pass (13,050 ft), which once thrived with alpine meadows and fragrant flowers, today reeks of trash and junk and smells of choloroflorocarbons (CFCs), exhaust gases generated by vehicles and “dust storms” raised daily by unending droves of tourists that throngs the pass every day. The state government has filed another chargesheet against former chairman of Himachal Pradesh Service Selection Board S.M. Katwal in the court. The challan has been filed in the court of special judge (District and Session Judge, Hamirpur) V.K. Sharma by the Vigilance Department. The condition imposed by the Department of Ayurveda for mandatory registration with it for being considered for over 60 posts of BAMS doctors, has barred those Himachalis’ practising outside the state, from applying for it. A team of the health, ayurvedic and homeopathic departments in association with the local drug inspector raided the clinics of seven medical practitioners in a drive against quacks today. The raids were conducted under the leadership of CMO J.S. Chandel. In the past one week, many local leaders have left the party after realizing that they will not be able to get the tickets. The ruling party has suffered a severe set-back in Jaswan, the home turf of the state party president Viplove Thakur, where the block president of the party Dharam Singh Parmar has joined the BSP. From this constituency, she is trying to get the party ticket for her brother. The sitting MLA of Kangra Surinder Kaku is also facing trouble with local leaders of the party opposing him. Apart from the sitting MLA there are four other aspirants Uttam Dogra, Raj Kumar, Krishan Chand and Ajay Verma for the party ticket from here. In Dharamsala, a local municipal commissioner Virendra Parmar has left the Congress and joined the BJP giving a set-back to Chandresh Kumari, the sitting MLA. Apart from her, there are as many as six other aspirants Manoj Kumar, Navneet Sharma, Subh Karan, Atulya, Subash Nehriya and Anupama Sharma, who are also in the fray. In Nurpur, after the retirement announcement of senior party leader and revenue minister Sat Mahajan from the electoral politics has created a problem for the party with many aspirants coming to the fore to attain the party ticket. The veteran leader is lobbying for his son Ajay Mahajan, who has been active in the state politics for the past four years. But there are local leaders, who are themselves vying for the ticket. The president of the local municipal council Rakesh Mahajan and two other aspirants Rakesh Kumar and Manoj Pathania have been aspiring for the party ticket. The MC president has reportedly threatened to leave the party if the ticket is not given to him. The Shahpur constituency is also in focus after Major Vijay Singh Mankotia’s ouster from the party. There are as many as six aspirants from here, including Kewal Pathania the state president of the national students union, who is considered close to the Chief Minister. Other aspirants are Bina Sharma, Dev Dutt Sharma Karan Parmar, Karnail Guleria and Has Raj. This is for the first time that the ruling party is witnessing a tussle over distribution of the party tickets for the assembly polls. Still, there are some constituencies like Jaswan, Kangra, Nurpur, Shahpur, Jawalamukhi, Gangath and Sullah left on which the state election committee as well as the central screening committee could not deliberate upon the list of candidates even as all top leaders of the state, including Chief Minister Virbhadra Singh are camping in New Delhi to evolve a consensus on the allotment of tickets. A senior leader of the party said that the onus of the party high command will be to look for candidates having winning potential and the ability to neutralise the possible rebellion and anti-incumbency factor. With the elections to the three tribal belts being over, leaders of both parties are now busy in shortlisting probables for the 65 Assembly segments polling for which will take place in December. The BJP will hold its state election committee meeting in Delhi on November 20, while its central election committee will meet two days later to take a final decision on candidates. All senior leaders will leave for Delhi after the rally at Mandi tomorrow. Although the two-member committees for each of the four parliamentary constituencies have given their lists to the party high command, Shanta Kumar and P.K. Dhumal would be pleading the cases of their supporters to get a major chunk in seat allotment. The screening committee meeting of the Congress will also be held in Delhi tomorrow. The state election committee that met in Delhi in the first week of November had fixed November 18 as the date for holding a meeting of the screening committee. Almost all senior Congress leaders, including Chief Minister Virbhadra Singh and HPCC chief Viplove Thakur, are in Delhi, ticket aspirants have also rushed there. It is reliably learnt that there is no controversy over the candidates from around 24 seats as only one person has applied for the party ticket from these seats. As such, these names are likely to be approved without much discussion. The issue of giving ticket to five associate members in the house, who have been supporting the Congress, is likely to be taken up at the meeting. The BJP and the BSP have pasted posters on the walls along the highways, roads and in Mandi, Balh and other places. walls can be seen covered with posters and slogans, which is tantamount to violating the model code of conduct. With the saffron banners and posters carrying pictures of former Prime Minister Atal Bihari Vajpayee and L.K. Advani and party chief Rajnath Singh sprouting all over the highways and other roads, the town today wears a saffron look as Rajnath Singh among other BJP state leaders Shanta Kumar, Prem Kumar Dhumal and Jai Ram Thakur will address the Yuva Garjna rally targeting state’s over 9-lakh unemployed youth. They are to kickstart party’s political campaign for the second phase of state Assembly elections at the Paddal stadium here tomorrow. The Suketi bridge, old Mandi bridge, Paddal stadium, including Pathankot-Mandi and Bilaspur-Mandi Kullu highways around the town are clad in saffron flags. The party workers have put up banners and posters all over the place to make the rally a big show of strength to outsmart the rival Congress and the new third force the BSP, which is also registering its presence in the highways and roads putting party symbols. The BJP has targeted the Youth in the rally and is roping in a large number of young party workers for the rally. The party will kick start its campaign here tomorrow for the rest of the 65 Assembly segments which will go to polls on December 19. Party president Jai Ram Thakur said today, “The Congress government had misled youth of the state as it was because of them it won the last election. The party had promised that it would employ at least one member from each family, but party did nothing in this regard”. Thakur added that the youth in the state constituted a large percentage of voters and were disillusioned with the Congress as it had betrayed them for the past four years. “They will voice their grievances at the rally as the party is really concerned about their plight”, he added. After kickstarting the campaign tomorrow here, the party has in fact planned five major rallies one at Shimla, Solan Kullu, Kangra and Hamirpur which would be addressed by national leaders like L.K. Advani, Rajnath Singh, Sushma Swarj, Dr Murli Manohar Joshi and others, said Thakur. He said the BJP government would rid employees from the problems of frequent transfers as it would come out with a transparent transfer policy for the employees in the state, which would be acceptable to both government and employees. Shanta, who was addressing the state government at his residence this morning regretted that during the Congress regime the transfer of employees had become an industry and a number of Congress leaders were minting money out of it. He said he had received reports that there were middlemen in the Congress government who were first getting employees transferred and later got their transfers cancelled by taking huge amount of money. Earlier hundreds of non-gazetted employees of the state government marched to Shanta’s residence and pledged their support to the BJP in the coming Assembly elections. These leaders said they wanted a neat and clean administration in the state after the elections and Shanta could only provide that, therefore, they had extended their support to him. NGO leader Subhash Sharma, while addressing the employees in the lawns of a Hotel said Shanta ruled the state twice and he took historical decisions for the welfare of the employees. The joint action committee of employees was constituted at the behest of. Shanta. Addressing the employees HP Karmchari Mahasang president V.K. Kaul said during the Congress regime, over 3 lakh employees were shifted without assigning any specific reason and later only those transfers were cancelled where money was passed to the Congress leaders or employees leaders close Chief Minister Virbhadara Singh. He said it was imminent that BJP in the state would assume power after the Assembly elections; therefore, the state government employees had come open in the support the BJP. Appreciating Shanta he said he was a great visionary, policy maker and thinker, who could provide best administration in the state, therefore, it was needed that every one should support him. NGO leaders from Shimla, Chamba, Bilaspur, Mandi and Kulu also present. Not only are the two former MLAs who have applied for the ticket but there are many top leaders of the Nadaun BJP mandal along with few ex government employees who have also applied. Among applicants, Babu Ram Mandial, who has represented the constituency twice in the Assembly in 1972 and 1998 was the BJP candidate in the last election too but was defeated by Congress candidate Sukhvinder Singh. Dhani Ram has also been the party candidate twice in 1982 and 1985 but won in 1982. Raghubir Singh and Prabhat Chaudhary had contested the election from this constituency as independent candidates. Jagdev Singh Jaggi is the BJP mandal president of Nadaun. The choice of party candidate is becoming difficult with Raghubir Singh, who owes allegiance to Shanta Kumar, and had contested the last election as Mitar Milan candidate; most of other serious candidates are linked to Prem Kumar Dhumal. Former police officer A.N. 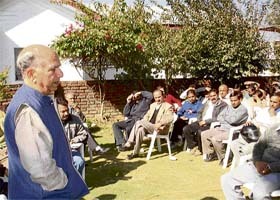 Sharma, Prabhat Chaudhary, Dhani Ram, Babu Ram Mandial, and Jagdev Singh Jaggi etc are considered to be in Dhumal camp. Since Dhumal is going to play a very crucial role in deciding party candidates for all Hamirpur district seat he would also be in a fix in case of Nadaun. While Sitting Congress MLA from this constituency is considered the strongest party candidate in Hamirpur district and the BJP leadership would like to field the best candidate in Nadaun. As caste combination is also important and the BSP leadership is keeping an eye to rope in a rebel from the BJP, the party leadership would have to be very cautious in selecting BJP candidate here. He said the special budget earmarked for tribal areas had been misused for political ends and that the Congress had sabotaged the Waqf Board’s properties at Dharamsala, Mcleodganj, Nurpur, Shimla, Una , Mandi , Kullu and Chamba. The State Waqf Board had been politicised by the government, he added. Himachali lamented that with the concerted efforts of former Union minister Shanta Kumar, former Chief Minister Prem Kumar Dhumal and former Prime Minister Atal Bihari Vajpayee, gaddis and gujjars had settled in the state and had got the Scheduled Tribe status. He said whereas the present state government had cut the annual budget of tribal areas. He accused Virbhadra Singh’s government of deliberately not implementing the 15-point programme of Union government meant for the uplift of minorities in the state. The team comprising election commissioner Naveen. B. Chawla, deputy election commissioner B. Balakrishnan and secretary, K. F. Wilfred held a meeting with the DCs and SPs of three districts of Shimla, Solan and Sirmaur. Chawla asked the officials to be vigilant against cross-border movement of illicit liquor and anti-social elements. Chawla said the issue of sealing the borders in consultations with their counterparts in the neighbouring states should be taken up. Chawla also advised them to keep a track of surrogate advertisements in the media and the have a contingency plan in place in case of inclement weather conditions. R. Balakrishnan discussed at length various relevant issues like strict implementation of model code of conduct, electronic voting machine (EVM) training and awareness and to effectively check the problem of dual voters. Chief electoral officer Manisha Nanda said proper checking and verification of photo-electoral rolls was being done by district officers on priority. The electronic voting machines (EVMs) used at 32 polling stations falling in the Pangi tribal subdivision have been dispatched from Killar to the office of the returning officer headquartered at Bharmour by a helicopter under the supervision of additional chief electoral officer G.K. Srivastva. Returning officer of the Bharmour tribal constituency N.K. Lath said the EVMs were sent duly sealed in the presence of authorized representatives of the Congress, the BJP, the BSP and Independents accompanied by sector officers and security personnel. The EVMs would be kept at Bharmour along with the EVMs of 72 polling stations of the Bharmour tribal subdivision for counting that was scheduled for December 28, the returning officer added. Former minister and district president of the BJP, Mohan Lal, today assured that the cement plant would be BJP’s top priority. He said the cement factory would generate employment opportunities to a large number of people in the state. The Beas Kund glacier, believed to be a hermitage of sage Ved Vyas, is as good as dead. Haphazard parking of vehicle from Rani Nala to Rohtang Top is another eyesore. As ponies are a preference for the tourists interested in visiting the pass and nearby areas, animal dung littered here and there is also a common sight. The main attraction for the tourists visiting the Kullu-Manali circuit is the snow bounty of Rohtang. But the natural beauty has been destroyed. Tourists virtually breathe dust and CFCs. Even the thin coat of snow in the higher slopes of Rohtang wears a dusty look as plumes of dust settle on it daily. One can see trash and junk left behind by tourists along the slopes in the Beas Kund glacier area. The Border Roads Organisation (BRO), which is widening the Manali-Rohtang-Keylong-Leh highway has yet to raise proper retaining walls and culverts to stabilize the fragile slopes. The road debris is washed down the slopes along with trash and junk, eroding the fragile ecology, ecologists maintain. Trash litters the course of the tens of small seasonal water channels that run down the slopes like Rohtang’s arteries into the Beas stream. Wrappers of food stuff, waste papers, empty mineral water bottles and others wastes litter the slopes. The Special Area Development Authority (SADA), Manali, created to protect the Solang-Marhi-Rohtang area seems to have failed in its task. Marhi on the base of Rohtang is also an open picture of trash and junk as waste dumped by dhaba owners litters the surroundings. The picture is no different at Rohtang Top, Rani Nala, Beas Nala and other tourist spots. “There is a need to ban plying of taxis, buses and other vehicles on the top. The treks for ponies should be well-laid and the snow area should be protected,” said Debasish Chakroborty, a marine engineer from Kolkata, and Wilson, his friend from London, who visited Rohtang a few days ago. There is no regulation of tourist traffic from Manali towards Rohtang. Over 1,000 vehicles ply on the roads leading to Rohtang daily. Obviously, traffic jams are also a common sight here. Tourists say they pay green tax, but the authorities have not yet done anything worthwhile for protecting ecology or promoting and regulating tourism activity. The state government has filed another chargesheet against former chairman of Himachal Pradesh Service Selection Board (HPSSB) S.M. Katwal in the court. The challan has been filed in the court of special judge (District and Session Judge, Hamirpur) V.K. Sharma by the Vigilance Department. The case pertains to the alleged irregularities in the selection of lecturers for commerce in the school cadre in which FIR was registered by the Vigilance Department on March 17, 2004. After an investigation, the department had sought permission to prosecute S.M. Katwal, which chief secretary of the state government granted on September 22 this year. Former chairman of the HPSSB has been accused of influencing his fellow member of board, Vidya Nath, to give remarks in the result sheet though chairman himself had not given any remark. The written examination for filling up the posts of BAMS (Ayurveda) doctors is scheduled to be held here tomorrow. Several Himachalis’ registered with the registrar, Ayurveda, and working in other states, have been barred from applying for these posts. Some doctors practising outside the state said the rule was wrong. “Since we can be registered in only one state, we will have to get our name deleted from that place where we are established and in case we are not selected, we will be on the road,” said a doctor practising in Punjab. Many such candidates said the imposition of the rule at this stage was wrong and this would keep many Himachali doctors from coming back to the state. They admitted that once they were selected, the condition could then be imposed, as they would be sure of a job. Many doctors from Government Ayurvedic College, Paprola in Baijnath, and practising in other states said: “Majority of us are keen to come back but this kind of absurd condition is a sure way of keeping us out of Himachal,” they rued. They said the recruitment policy with such a condition was wrong and the posts should be advertised again. The Secretary, Ayurveda, Narinder Chauhan said he would take suitable action as soon as the matter was brought to his notice. The department had fixed a fee of Rs 3,000 for registration for applying for 60 posts of BAMS doctors. Candidates rued that the condition of registration should be imposed only when they are selected. They pointed out that many doctors hailing from Himachal had not been able to apply for the posts as they could not take the risk of getting their registration cancelled in the other states even before they appeared for the written exam. Drug inspector of Kangra district Navneet Marwah said the raids were conducted in Gharoh, Kangra, Yol and Banoi areas of the district. He said allopathic medicines from a clinic at Gharoh were seized as the owner could not produce any valid documents/ licence to sell medicines. “A case under Section 18 (C) of the Drugs and Cosmetics Act was registered against him,” he said. The drug inspector said two practitioners at Gharoh and Banoi were given notices to produce documents of being registered medical practitioners, otherwise a stern action would be initiated against them. The CMO said the quacks would not be allowed to play with the lives of innocent people. The drive to identify and punish quacks would continue across the district, he added. One person was killed and a woman injured after a scooter crashed into a Himachal Road Transport Corporation (HRTC) bus today, the police said.